Colson Whitehead has established himself as one of the most versatile and innovative writers in contemporary literature. From the secret lives of elevators to international poker tournaments, Whitehead takes on the marginal, the strange, and the surreal. His newest novel, The Underground Railroad, reimagines pre-Civil War America, exploring an alternate reality in which the underground railroad is no mere metaphor, but an actual subterranean train system delivering slaves to freedom. The novel was a #1 New York Times bestseller and won both the 2016 National Book Award and 2017 Pulitzer Prize for Fiction. This program is part of the “Democracy and the Informed Citizen” initiative, administered by the Federation of State Humanities Councils. We thank The Andrew W. Mellon Foundation for their generous support of this initiative and the Pulitzer Prizes for their partnership. Do I need a ticket to attend the event? Yes. All attendees (including UA students, faculty and staff) will need to present an Eventbrite ticket upon arrival to the event. Seating is based on a first-come, first-serve basis. Those who arrive without a ticket will be directed to a stand-by line and will be seated, according to availability, starting at 6:50 p.m. The doors to the North Ballroom will open at 6:30 p.m.
What is the format of Mr. Whitehead’s talk? Mr. Whitehead will speak for about 45 minutes followed by a 15 minute Q & A session. Will Mr. Whitehead’s book be available for purchase at the event? The Underground Railroad and other Whitehead books will be available for purchase prior to and following his talk. Will Mr. Whitehead be willing to sign my book? Yes, book signing will take place after the presentation. Arizona Humanities is pleased to present “Author + Talk: Nómada Temporal with Luis Ávila” on Tuesday, October 24 from 6pm to 8pm at the Ellis-Shackelford House (1242 N. Central Ave Phoenix, AZ 85004). The event will include a Spanish reading and bilingual conversation with Luis Ávila, a Phoenix resident, writer, journalist, and radio and theater producer. His work involves opinion, poetry, essay, and translation. Nómada Temporal takes place in seven countries and more than 25 cities. After his house was robbed for a second time in a short timeframe, Luis decided to put everything in a storage and travel a couple of months. He never imagined that the trip would extend for over a year, meeting fascinating individuals, processing the heartache of a breakup, witnessing terrorism, assault, culture, identities, moments of deep doubt, solitude and adventure. Narrated in four times (Tiempo, Destiempo, Contratiempo y Pasatiempo), and with ilustrations by Chela Meraz, Nomada Temporal takes the reader through inhospitable paths, moments of nostalgia, sickness, rage and the constant feeling of displacement that migrants know well. You can find more information on the event’s Facebook page as well. In celebration of National Poetry month, Arizona Humanities is hosting a poetry workshop on Saturday, April 8th, from 9:30 a.m. to 2 p.m. This poetry workshop will focus on the omnipresence of sacredness in our everyday environments. Jaclyn Roessel of Grownup Navajo will take you on a journey across the urban desert landscape. Participants will travel by the Valley Metro light rail across Phoenix and embark in several writing exercises. The goal of this session is to explore the intersection of engagement in our community and mindful approaches to our craft. The session will begin at the Ellis-Shackelford house (1242 N. Central Avenue Phoenix, AZ 85004), home to Arizona Humanities. Participants can meet at 9:30 a.m. for coffee and pastries, then at 10 a.m. the group will start their journey to the different stops along the light rail including Civic Space Park, Pueblo Grande Museum, and “A” Mountain in Tempe. The day will wrap up with light refreshments and an open mic session back at Arizona Humanities in Phoenix. This event is free, however participants are responsible for the 4$ light rail fee. See the Facebook Event page for more information. Participants can RSVP through Eventbrite. Arizona Humanities will be hosting a free event with Dr. Rashad Shabazz. Shabazz will be reading from his book Spatializing Blackness: Architectures of Confinement and Black Masculinity in Chicago. His book explores the history of confinement, policing, surveillance, urban planning, and incarceration of African American communities on the city’s South Side. Dr. Rashad Shabazz is an Associate Professor with the ASU School of Social Transformation. Dr. Shabazz’s academic expertise brings together human geography, Black cultural studies, gender studies, and critical prison studies. His research explores how race, sexuality and gender are informed by geography. His most recent work (Spatializing Blackness, University of Illinois Press, 2015) examines how carceral power within the geographies of Black Chicagoans shaped urban planning, housing policy, policing practices, gang formation, high incarceration rates, masculinity and health. Shabazz’s scholarship has appeared in Souls, The Spatial-Justice Journal, ACME, Gender, Place and Culture and Occasions and he has also published several book chapters and book reviews. He is currently working on two projects: the first examines how Black people use public spaces to negotiate and perform race, gender and sexual identity as well as to express political or cultural identity. The second project uncovers the role Black musicians in Minneapolis played in giving rise to “the Minneapolis sound”. The event takes place at Arizona Humanities, 1242 N Central Ave, Phoenix, Arizona. 85004 on Thursday, October 13 at 6:30 p.m. RSVP to Ellie Hutchison (ehutchison@azhumanities.org or 602-257-0335.). For more information, please visit the Facebook event. Phoenix, AZ – The public is invited to join Arizona Humanities for a talk with local author Robert Isenberg. Isenberg will kick off your summer travels with stories and inspiration from his works, including his newest book, The Green Season about his life as a journalist in Costa Rica. The Authors Night takes place at the historic Ellis-Shackelford House in downtown Phoenix (1242 N. Central Avenue Phoenix, AZ 85004) on Tuesday, June 7th from 6:00-8:00pm. The program is free and light refreshments are included. Isenberg describes his many years as a travel writer and journalist, scouring the globe for provocative stories. Hear about his rustic New England origins, life as a freelancer, and the evolving nature of long-form nonfiction. Considering a trip to Costa Rica? Ask him anything. This author night promises lively discussion about adventure in the age of the smartphone. Seating is limited and guests are encouraged to RSVP at https://robertisenbergauthorsnight.eventbrite.com or call 602-257-0335. About Robert Isenberg is a freelance writer, filmmaker, and stage performer. Most recently, he is the author of The Green Season, about his life as a journalist in Costa Rica. His work includes five books, 17 produced plays, dozens of short documentaries, and hundreds of articles for various magazines and newspapers. He created two one-man shows, The Archipelago (about his travels in postwar Bosnia) and One Million Elephants (about the Secret War in Laos). Isenberg is a past Whitford Fellow, Brackenridge Fellow, and recipient of two Golden Quill Awards, as well as a Pushcart Prize nominee. Visit him at robertisenberg.net. Arizona Humanities is hosting Workshops to celebrate the 20th Anniversary of National Poetry Month this April. Free programs and workshops will take place across Arizona in Gilbert, the San Carlos Apache Reservation, downtown Phoenix, and Flagstaff. Programs in Arizona will feature local Arizona poets Josh Rathkamp, Laura Tohe, Orlando White, Cynthia Schwartzberg Edlow, and one national guest poet, J Mase III, with Josh Rathkamp’s workshop upcoming on the 7th. Read the program details, poet bios, and registration information here. Tune in on twitter @AZhumanities for daily writing prompts and tips from poets throughout the month. For more information, visit www.azhumanities.org or call 602-257-0335. Follow #AZpoetry for updates and news. 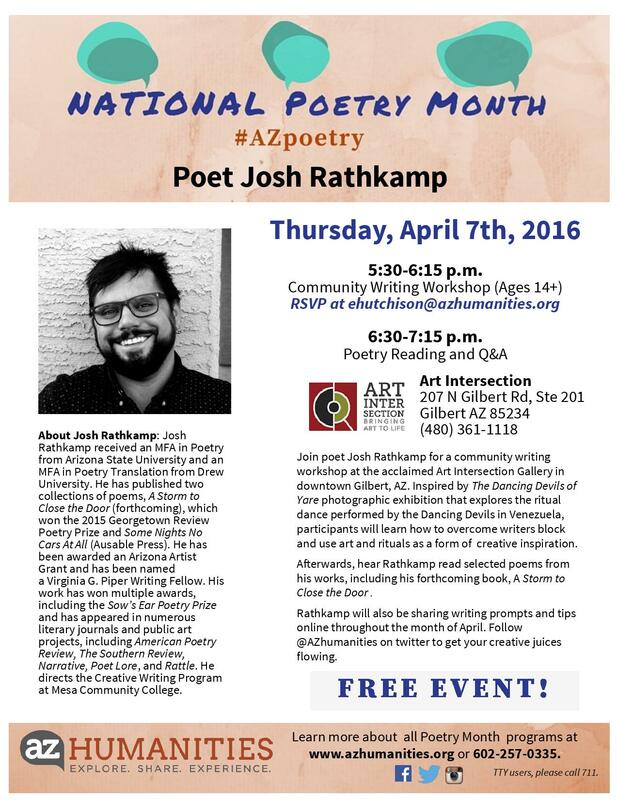 For questions about poetry month programs contact Programs Manager Ellie Hutchison, ehutchison@azhumanities.org. 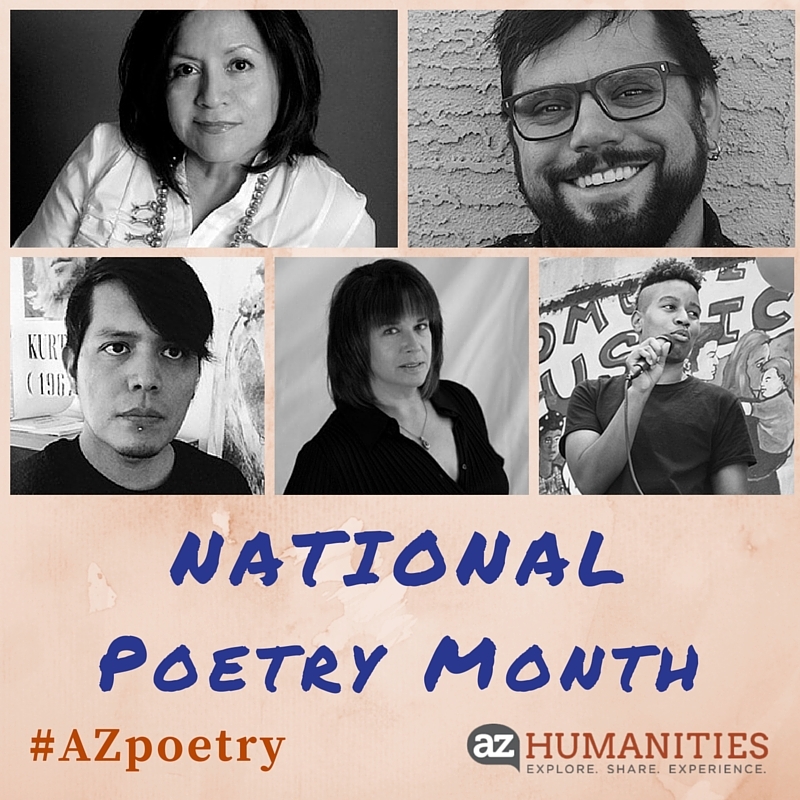 Arizona Humanities is excited to announce a series of programs celebrating National Poetry Month during the month of April. Free programs and workshops will take place across Arizona in Gilbert, the San Carlos Apache Reservation, downtown Phoenix, and Flagstaff. Established by the Academy of American Poets in 1996, National Poetry Month is the largest literary celebration in the world. The month aims to encourage the reading of poetry, inspire people to write poetry, and more. Programs in Arizona will feature local Arizona poets Josh Rathkamp, Laura Tohe, Orlando White, Cynthia Schwartzberg Edlow, and one national guest poet, J Mase III. Read about the program details and poet bios at http://www.azhumanities.org/national-poetry-month/. Tune in on twitter @AZhumanities for daily writing prompts and tips from poets throughout the month. For more information, visit www.azhumanities.org or call 602-257-0335. Follow #AZpoetry for updates and news.